“It’s just a tub of water, big enough to get into,” summarises Francis Hodgson, author of The Swimming Pool in Photography. But as his joyous edit of images proves, our relationship with the pool is far more complex than simply somewhere to exercise in or laze around nearby. The swimming pool was the setting for major social change: it caused a reassessment of what was considered ‘decorous’ for women in terms of behaviour and dress, it created a new space for the sexes to socialise, and its fashions helped to usher in a new ideal of female beauty. Where you chose to lay down your towel said a lot about who you were: a family enjoying a holiday at a Butlins resort, a sunbather lying by a cat-shaped pool in Miami, a visitor to a London lido, the commissioner of a private infinity pool in Alicante, a diver teetering from the highest platform of the diving board. The pool is the attraction, but the story is the person making their way into the water, and how and why they do it. For children, the swimming pool is often an early foray into a world with looser adult restrictions. Babies float around in their mothers’ arms, getting a tiny taste of independent movement, young kids flail and jump and bowl down water slides, teenagers flaunt and flirt. There is danger, but there are lifeguards, so parents can sip cocktails with impunity, interrupted only by the occasional check on their offspring’s sun cream levels. 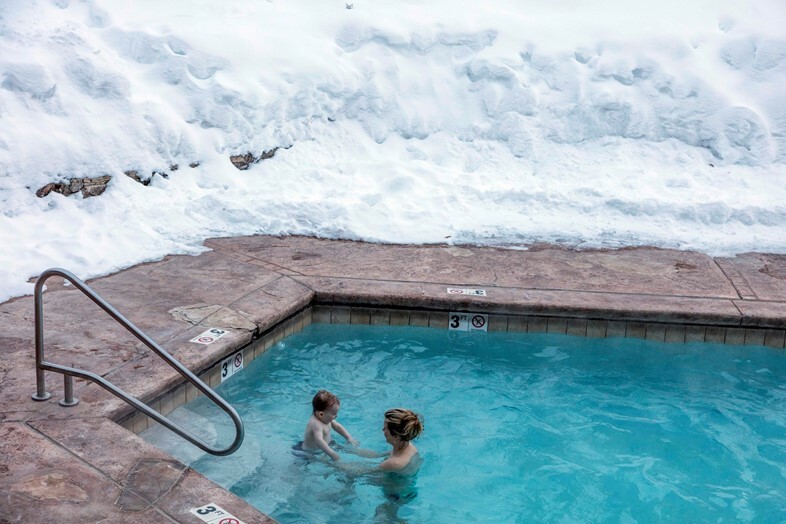 Martin Parr’s images of families covering every surface on land and in the water at an artificial beach in Japan, and under a sweltering sun in Brighton, show that love for a public pool transcends cultures, while Carol M. Highsmith’s shot of a mother and son taking a dip in a heated pool in snowy Vail, Colorado, demonstrates how the pull of the pool defies even sub-zero temperatures. The pool is the perfect place to get competitive and show off your physical prowess. Doing countless laps of a 50 metre Olympic-size will hone the body, but it isn’t the best for posturing. This is where the diving board takes over. 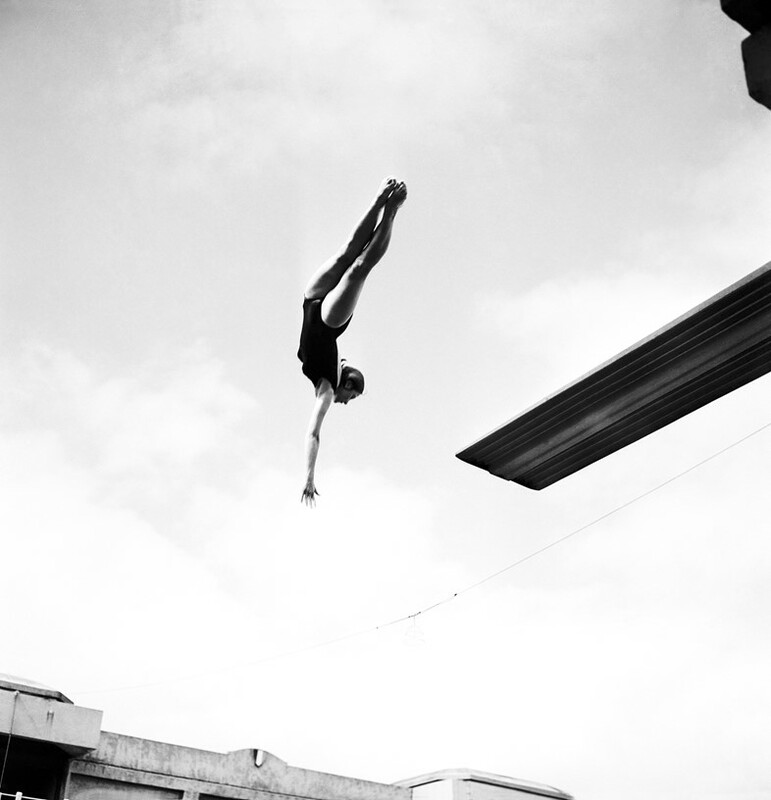 For Hodgson, “the appeal of diving is obvious: a brief moment of flight. Just as obviously, it could have been invented for photography.” We have always been transfixed by the elegance of a well-executed dive, wondering at the courage and grace of athletes such as Blandine Fagedet twisting and turning in mid-air. We have always admired the speed of the Olympians maximising their race speed with a low flat spring into the water. But perhaps best of all are the belly flops and the bombs – less picturesque perhaps, but far funnier to watch. The rise in popularity of the swimming bath was part of a change in norms. 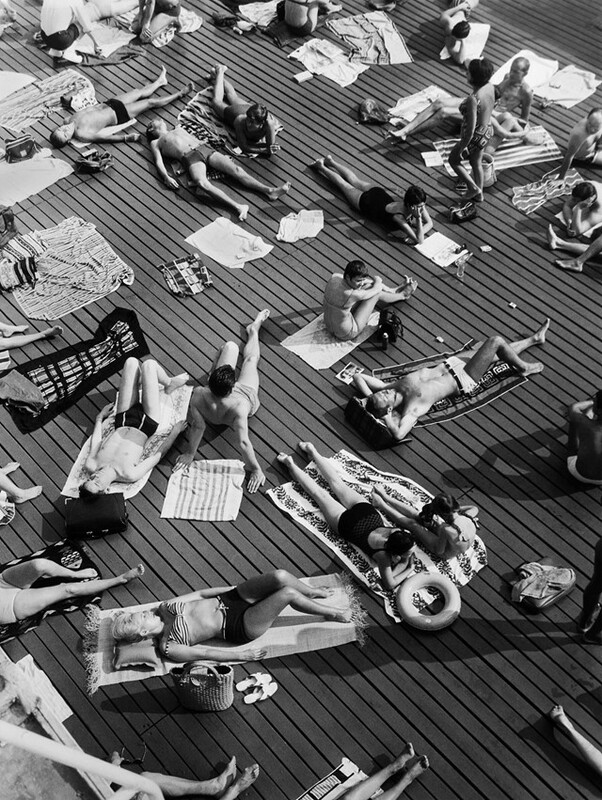 While there had been separate men and women’s pools for most of the early 20th century, in the 1950s things began to loosen up. Family resorts like Butlins hastened this path, while in America, the municipal swimming pool became a key battleground for the civil rights movement in their fight against segregation. Across London, lidos popped up everywhere, beloved not just for their large swimming pools but for their expanses of poolside lounging room, where men and women could interact and flirt. The pool was a hotbed for romance – minimal clothing and steamy weather often has that effect – but also a safe space with everyone held under the beady gaze of the lifeguard. Today it’s the helicopter, but for decades a swimming pool was the key status indicator of the rich and famous. The wealthy planned their mansions around the infinity pool, the kidney-shaped pool, or perhaps something more singular – see the Texan with a pool in the shape of a cowboy boot. Works by photographers like Slim Aarons, René Burri and Terry O’Neill confirm the eternal association between wealth, fame, happiness, even Academy Awards, and a beautiful swimming pool. Nowhere is this better expressed than in California, where the status symbol of the pool is in direct conflict with the county’s constant drought problems. 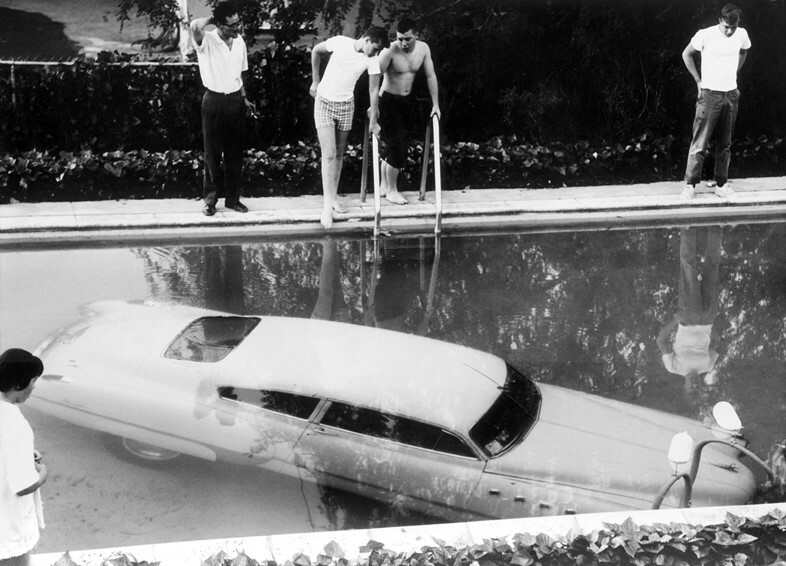 No matter, the pool is a necessity for those who have the money, even if one of them gets so drunk as to mistake a pool for a parking space and drive their Cadillac straight into it. The increased popularity of the pool has had a seismic effect on swimming style, being arguably partly responsible for the rapid diminishment in the number and scale of garments it is considered socially acceptable for people to wear. In 1912, the British female freestyle relay team at the Stockholm Olympics shocked the world by abandoning their swathes of “appropriate” dress and appearing instead in closefitting silk costumes designed for racing. It was Frenchman Louis Réard who really set the cat among the pigeons with his release of the bikini – marketed as “the first an-atomic bomb” – in 1946. It was an immediate hit, but was also banned in many European countries as a threat to public order. Brigitte Bardot helped it go mainstream, as did, some years before, Coco Chanel’s promotion of a deep suntan as both flattering and a status symbol. Today it is acceptable to wear pretty much anything in the pool, although cultural differences remain. In France it is seemingly obligatory for men to wear clinging trunks, while in 2009 Alton Towers banned Speedos from its water parks. 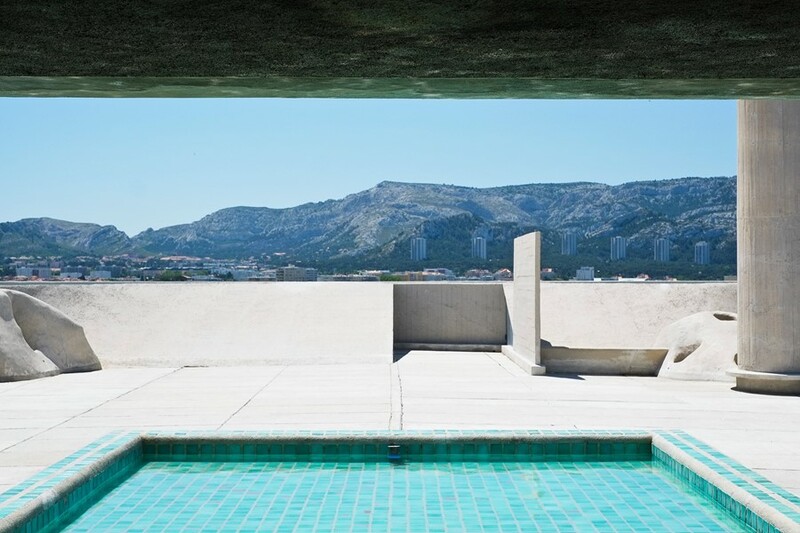 The Swimming Pool in Photography by Francis Hodgson is available now, published by Hatje Cantz.